Europe's capital is more than just beer, moules and chocolate, as you will soon discover with our Brussels Treasure Hunt. Our latest new treasure hunt is in Bristol, one of England’s largest medieval cities, newly regenerated for the millennium. 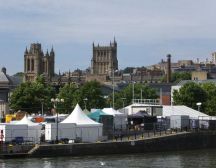 The route starts by the Cathedral and takes in the old central market area along Corn Street, Georgian Queen Square and Millennium Square in the regenerated docks area. Founded in about 1000 AD, Bristol gets its name from the Old English Brycgstow, meaning ‘place of the bridge’. Under the Normans, it had one of the strongest castles in southern England, and resisted an invasion by the sons of the deposed king Harold. The port developed in the following century, and Bristol became, along with York and Norwich, one of the three largest places in medieval England after London. In 1373, Bristol was made a county in its own right – not many people know that it still counts as a ceremonial county today. But it was only in 1542 that Henry VIII granted city status to Bristol, also creating Diocese of Bristol and making the 12th century St. Augustine’s Abbey a cathedral. The Cathedral now again faces onto the large open space of College green following an enhancement project in the 1990s. 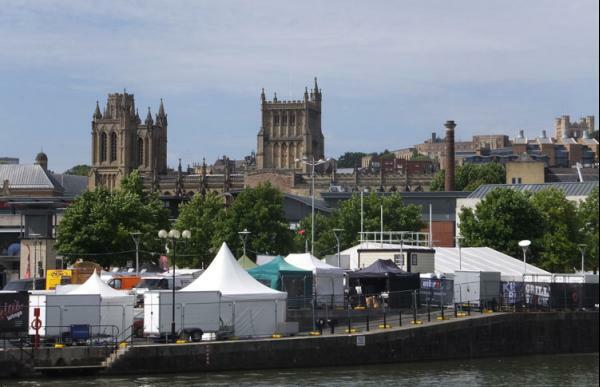 The importance of Bristol as a port gave rise to the expression “shipshape and Bristol fashion”. John Cabot set sail from here to discover North America in 1497, and you can now visit a replica of his ship, the Matthew. Isambard Kingdom Brunel’s SS Great Western and SS Great Britain were built and launched here, and the latter is now permanently moored in dry dock as a museum. Other attractions around the harbour include the M Shed industrial museum, and the Thekla, a nightclub-ship with a Banksy graffito on the hull. There are regular ferry boats that will take you across and around the harbour for as little as £1.